When Rocky was new to Sodor, Gordon and Edward were skeptical about his abilities, noting that Harvey could travel under his own power. Later, Edward carelessly left the docks before his cargo was properly secured, causing pipes to spill onto the main line. Edward was adamant that Harvey clear up the line, but the engine was too small to finish it quickly, and as a result Gordon crashed into the poles. 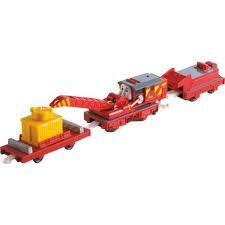 Edward returned to Brendam to pick up Rocky, who cleared the line and brought Gordon back to the rails. Since this incident, Rocky has become an invaluable asset to the railway. He is frequently called upon to lift loads and help out after accidents.